Abstract Purpose – In the era of globalisation and information and communications technology, ebusiness is one of the critical issues in transport and logistics companies’ competition and growth. This study seeks to investigate the effect of various factors on the decision to adopt e-business among transport and logistics companies. 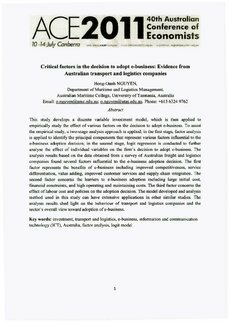 Design/methodology/approach – A two-stage analysis approach is applied to the data set obtained from a combination of online and mail surveys of Australian transport and logistics companies. In the first stage, factor analysis is applied to identify the principal components that represent various factors influential to the e-business adoption decision. In the second stage, the logit model is applied to further analyse the effect of individual variables on the firm’s decision to adopt e-business. Findings – Several key factors significantly affect the e-business adoption decision. The first factor represents the benefits of e-business including improved competitiveness, service differentiation, value adding, improved customer services and supply chain integration. The second factor concerns the barriers to e-business adoption including large initial cost, financial constraints, and high operating and maintaining costs. The third factor concerns the effect of labour cost and policies on the adoption decision. The analysis results shed light on the behaviour of transport and logistics companies and the sector’s overall view toward adoption of e-business. Research limitations/implications – The study and survey’s main focus is on firms’ investment decisions and expectations. Due to the research ethics requirements, the survey could not seek individual companies’ historical data for profit, revenue and cost which could be used to test for the effect of financial constraints. Instead, this effect is revealed by asking firms whether or not they are subject to financial constraints. Originality/value – This study takes the view that a decision to adopt e-business is essentially an investment decision. However, existing investment theories such as Jorgenson’s (1963) neoclassical theory and Tobin’s (1968) Q theory only concern the investment expenditure amount rather than the investment decision which is binary. Moreover, the role of business expectation has been largely ignored in empirical studies. The current study seeks to address these issues by investigating the effect of various factors on the decision to adopt e-business using data obtained from a company survey rather than secondary data.